Our universe is one heck of a place. Shrouded in mystery, scientists have tried since time immemorial to understand our place in the vastness of space. This search has led many astronomers—and philosophers in ancient times—to wonder whether or not humans are the only living species out there. This idea has captured the imagination and interest of scientists, philosophers, historians, archaeologists and ordinary people. And while we still have no idea how big the universe actually is, where we are in it, and what’s located all around us, most people would agree on the notion that given the massive size of the universe—we know its big, but not how big—it is ludicrous to think we are the only living species out there. As I’ve written before in different articles, our universe is so big that it’s hard to put into perspective. Now imagine for a second that just as there are other solar systems, there are other universes as well. This idea, or better-said theory, is referred to as parallel universes. Imagine the endless possibilities if scientists actually were to find evidence of other universes. Now, according to a pair of scientific studies published in the Monthly Notices of the Royal Astronomical Society, there are excellent chances that life can exist on planets located in parallel universes. As I’ve explained above, the notion that our universe is only one of many – perhaps infinite universes – is known as the multiverse theory. The scientific paradigm around it has established strict requirements for the formation of stars and galaxies such as those that exist in our universe take place. Taking all of this into consideration, an international group of scientists ran a massive computer simulation to build new universes under various conditions, where dark energy was a determining factor. To the surprise of the authors, it turned out that life could come into existence in more scenarios than researchers had anticipated. Dark Energy, the key to the Multiverse? A graph showing the distribution of Dark Energy in the Universe. According to scientists, Dark energy is a mysterious and invisible force that exists in the “empty” spaces of our universe. It is often referred to by experts as the archnemesis of gravity. While gravity contracts all matter, the dark energy separates it. And the latter is winning the cosmic battle according to astrophysicists. 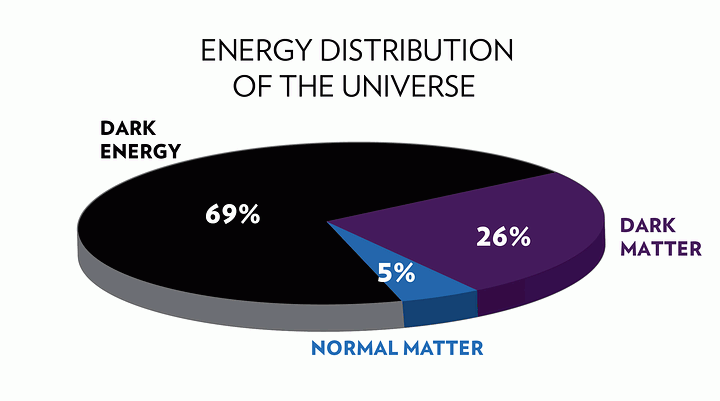 According to the best estimates of the current cosmological model, dark energy contributes practically to 69% of the total mass-energy of the universe. This amount, for whatever reason, is appropriate for galaxies to develop and harbor life, explain experts. It is thought that if we lived in a universe with too much dark energy, space would expand faster than galaxies could form. And, conversely, if there were a lack of dark energy, gravity would cause the galaxies to collapse into themselves before they can even be formed as such. It’s sort of like a cosmic balance. After having performed a number of different experiments and simulations, an international group of scientists from England, Australia, and the Netherlands used a program called Evolution and Meeting of Galaxies and their Environments to simulate the birth, life and eventual death of several hypothetical universes. In each simulation performed by experts, the amount of dark energy present was adjusted, going from none to several hundred times the amount existing in our universe. Scientists found that even in universes with 300 times more dark energy than ours, life managed to survive. “Our simulations showed that the accelerated expansion driven by dark energy has hardly any impact on the birth of stars, and hence places for life to arise,” study co-author Pascal Elahi, a research fellow at the University of Western Australia, said in a statement. According to the recent studies, if we are part of a Multiverse, we’d expect to see much more dark energy than we currently have—around 50 times more than we see in our Universe. Source: Could a multiverse be hospitable to life? Featured Image Credit: Prometheus Movie.